The Federal Motor Carrier Safety Administration (FMCSA) allowed a five-year exemption to grant a commercial driver’s license (CDL) for a product engineer holding a valid German commercial license so that he can test drive vehicles in the U.S.
A U.S. company requested the exemption for an employee of its parent company, located in Munich, Germany. The man is working in the U.S. to help develop technology advancements in fuel economy and emissions reductions in his company’s vehicles. To better understand the product requirements, the company requested the exemption so that the engineer can test the commercial motor vehicles (CMVs) in real-world environments and verify results. In granting the ruling, FMCSA believed that the man would achieve a safety equivalent to, or greater than, the level that is currently achieved by current regulations. This is the eighth such exemption granted by the FMCSA since 2012. To drive without a CDL, the man must comply with all Federal Motor Carrier Safety Regulations as well as carry the exemption document and a valid German commercial license. He must also be accompanied at all times by a holder of a U.S. CDL while operating a CMV. 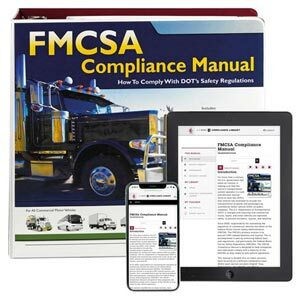 J. J. Keller's FMCSA Compliance Manual helps companies operating commercial motor vehicles (CMVs) comply with DOT regulations.